AT&T today announced a pilot project of solar-powered charging stations across all five of New York City's boroughs where the public can charge phones, tablets and other devices for free. AT&T said the project, dubbed AT&T Street Charge, grew out of lessons learned from Superstorm Sandy, which devastated lower parts of Manhattan, Queens and the other boroughs. During the storm, AT&T helped power New York City's distribution centers with commercial generators and pop-up cellular service. "Recognizing the need for a sustainable charging solution, AT&T teamed up with solar industry leader Goal Zero and Brooklyn-based design firm Pensa to develop the initiative and bring it to local residents," AT&T said in a statement. In all, about 26 charging stations will be installed over the next two and a half months. 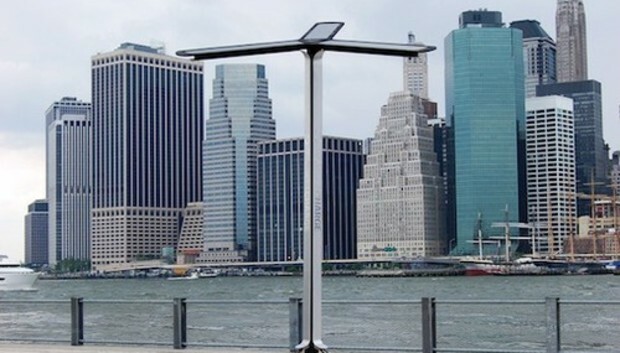 Currently, there are two solar mobile charging units now live at Brooklyn Bridge Park's Pier 1, and at Governor's Island, Union Square and Pier 1 at Riverside Park. The charging stations are shown being used in this AT&T video. This article, Power to the people: AT&T sets up free mobile charging stations in NYC, was originally published at Computerworld.com.